Tag Archives for " Jessica Rhodes "
I love podcasting, but not for the same reason so many other people are hyping it right now. Yes, you can build a business and make a bunch of money podcasting – just like you could five years ago with blogging. But the reason I love it and promote it for every small business is because it’s an awesome way to create content and a sneaky way to build authority and make connections. It’s not really that sneaky, but for years I’ve used podcasting to connect with interesting people, leaders, and people that could enhance my brand. Now, you can connect with thought leaders, but you can also connect with potential clients. Let’s say you target CEOs of mid-sized firms. Why not start a show that focuses on the challenges and success of CEOs of mid-sized firms. Awesome content, expert status for you, and maybe, just maybe you get access to a prospect that would never pay attention to your sales ovations. 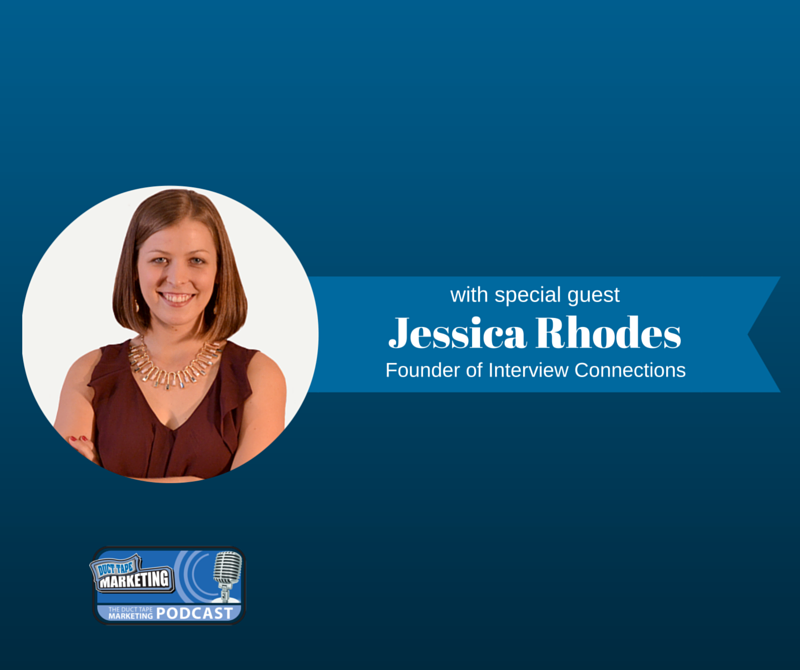 My guest for this week’s episode of the Duct Tape Marketing Podcast is Jessica Rhodes, CEO and Founder of Interview Connections, a source for booking podcast guests. Jessica and I talk about what it takes to give a good interview on both ends of the spectrum – as the interviewer, as well as the person being interviewed. Jessica knows the podcast industry. She is the host of the web TV show, Interview Connections TV, the Rhodes to Success podcast and she’s a co-host of The Podcast Producers, selected by Apple as a “How to Podcast” show in iTunes. As an interviewer, what’s your advice on where to find great guests? When you’re a guest on a show, what are 5 things you could do that will never get you booked again? Can you make money in being a podcast guest? Learn more about Jessica Rhodes and Interview Connections by clicking here.